Where others offered bright colours and bling, this blacked-out bruiser is darker and meaner, with painstaking attention to detail ensuring this bike feels as good as it looks. Harley-Davidson® Custom Vehicle Operations (CVO)™ re-writes the factory-custom style book with the introduction of the 2016 CVO™ Pro Street Breakout® motorcycle, a limited-production model that introduces a new, darker look utilizing cutting-edge finishes and textures applied with an obsessive eye to design and detail. Steeped in drag-racing attitude, the CVO Pro Street combines high-intensity performance with a long, muscular look that’s pure American street machine. Harley-Davidson CVO motorcycles are customized using premium components and exclusive paint treatments and surface finishes combined with numerous items from Harley-Davidson Genuine Motor Accessories. The CVO program is often used to introduce new custom elements and techniques, and the dark styling direction of the CVO Pro Street Breakout provided the Harley-Davidson design team with an opportunity to utilize several new finish treatments. One new finish being introduced on the CVO Pro Street Breakout model is called Smoke Satin Chrome. Scorched Chrome, a second new finish debuting on the CVO Pro Street Breakout, plates the Aggressor custom wheels. Restyled derby and timing covers have a new, mechanical look. Sheet metal is finished in solid Starfire Black or two-tone White Gold Pearl/Starfire Black, each with a single hand-applied graphic stripe flowing along the tank and rear fender to reinforce the performance theme of the CVO Pro Street Breakout. That performance is delivered by the Screamin’ Eagle® Twin Cam 110B™, the most-potent Harley-Davidson production air-cooled engine. To extract maximum performance the engine is fitted with black blunt-cut mufflers, an open-element Screamin’ Eagle® Heavy Breather Elite intake, and a high performance Assist & Slip clutch with hydraulic actuation. To help the rider take full advantage of the Screamin’ Eagle power, the CVO Pro Street Breakout is equipped with new 43mm inverted forks gripped in a robust three-bolt triple-clamp, plus the added stopping power of dual front disc brakes with floating rotors, a Reduced Reach front brake lever, and standard Anti-Lock Braking System. The stiff front end and 19-inch front wheel enhance agility, while a massive 240mm-wide rear tire effectively transfers power to pavement. There’s a lot of drag-racer influence found on the Pro Street Breakout, from the flat 1.25-inch drag-style handlebar to the wind-cheating speed screen and the color-matched chin spoiler. The deep bucket seat and bolstered pillion combine to hold the rider in place when the clutch is dumped and its Screamin’ Eagle horsepower launches the CVO Pro Street Breakout off the line. Other styling features include a trimmed front fender, blacked-out Airflow Collection accessories on hand and foot controls, black Profile custom mirrors, and a low-profile console with smoked braided vent lines. Electronic cruise control and the H-D Smart Security System featuring a new hands-free integrated security and locking fob are also standard equipment on the CVO Pro Street Breakout. 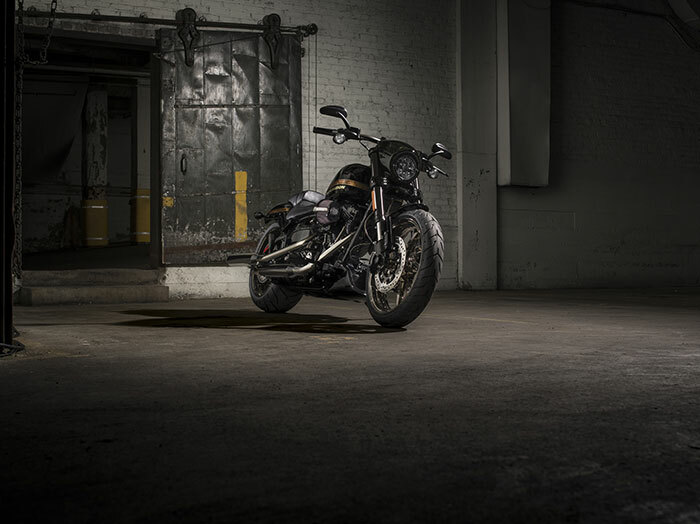 MILWAUKEE (JANUARY 27, 2016) – Today at X Games Aspen, Harley-Davidson unveiled the Low Rider® S and the Harley-Davidson® Custom Vehicle Operations (CVO)™ Pro Street Breakout® motorcycles – two additions to its 2016 model-year lineup, which is the most powerful collection of cruisers in the brand’s 113-year history. 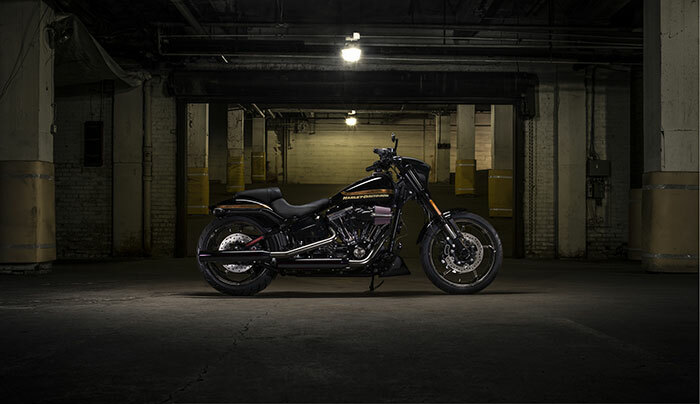 Raw, dark and trimmed to the essentials, the new Low Rider S motorcycle is the most powerful non-CVO™ Dyna® cruiser ever offered by Harley-Davidson. The Screamin’ Eagle® Twin Cam 110™ engine, Screamin’ Eagle® Heavy Breather performance intake and Fat Bob-style 2-into-2 exhaust deliver 115 foot pounds of peak torque at 3500 rpm. Premium suspension and brakes complete the performance package. 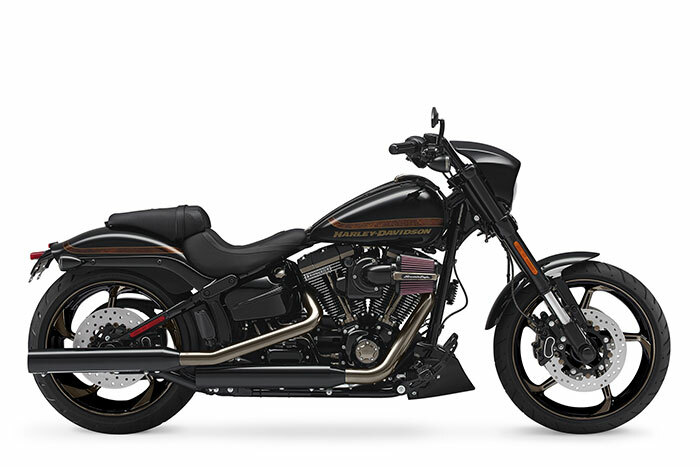 The new limited-edition bike joins the Fat Boy® S and Softail Slim® S models as the third in the new line of S series cruisers for the 2016 Harley-Davidson® lineup. 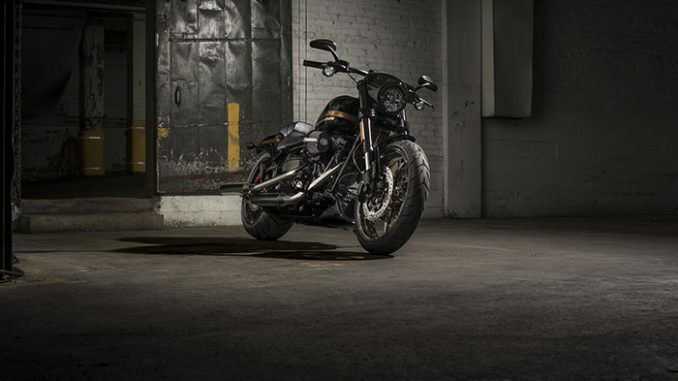 • The new Iron 883™ and Forty-Eight® models join the Harley-Davidson Street® motorcycle to assert Harley-Davidson’s leadership with its Dark Custom® motorcycle line-up inspired by the rebellious spirit of the past updated with modern design and performance. • High Output Twin Cam 103™ engines upgrade the power for all Softail® and Dyna® models (except Street Bob®) in the United States, Canada and Mexico. • The convenience of electronic cruise control is available on all Harley-Davidson Softail models. Enabled by new electronic throttle control, cruise control is standard equipment on 2016 Heritage Softail® Classic, Softail® Deluxe, Fat Boy S and Softail Slim S models and available as an accessory for all other 2016 Softail models. • All 2016 Sportster® models tame rough roads with all-new front and rear suspension and improved seats working together to enhance rider comfort and control. • Harley-Davidson’s touring segment leadership grows with the addition of the Road Glide® Ultra motorcycle to the Project RUSHMORE lineup and the refresh of the iconic Heritage Softail Classic model. No surface on this machine was left untouched when it came to adding the styling details. The engine alone has three finishes. Let your eyes wander across the metal and you’ll see every shade. Satin chrome pipes and scorched chrome wheels. Only CVO™ models take it to this level of detail. The fat rubber on the back of the CVO™ Pro Street Breakout® comes straight out of school of American muscle. It hooks up hard with the pavement when the light goes from red to green. Harley-Davidson® Custom Vehicle Operation™ motorcycles set the world standard for paint on a factory custom motorcycle. The CVO™ Pro Street Breakout® is a prime example of that. The color is deep and rich. There’s a racing-inspired stripe on the fuel tank and rear fender that accentuates the aggressive lines of the motorcycle. The Screamin’ Eagle® Twin Cam 110B™ engine pours its sound out to the street through staggered, 2-into-2, blacked-out, blunt-cut mufflers. You can recognize this bike with your eyes closed. 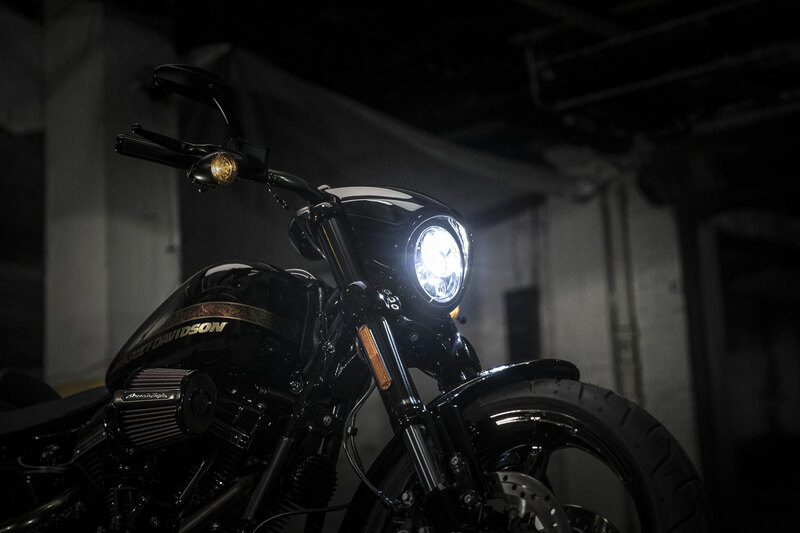 You get the modern look and darkness-piercing power of an LED headlight, turn signals and brake light on the CVO™ Pro Street Breakout®. The look of the front end of the CVO™ Pro Street Breakout® is custom muscle all the way. There’s a new chopped front fender and bracket, 43mm inverted front forks with black sliders and a new triple clamp held in place by three thick bolts on each side. The aggressive rake matches the aggressive look of the parts. The seat of the CVO™ Pro Street Breakout® was inspired by speed runs on the track. It keeps you tucked into the machine for a confident riding position. The finishing touch is a custom Harley-Davidson® CVO™ badge. The wheels on the CVO™ Pro Street Breakout® are a show all their own. Notice how tightly the low-profile tires wrap the five-spoke Aggressor wheels. Then check out the all-new scorched chrome highlights. Notice the deep, dark sinister hue. It’s a first in the motorcycle industry. There’s a new smoked satin chrome finish on the pipes, push rods, cylinder heads and timer cover. 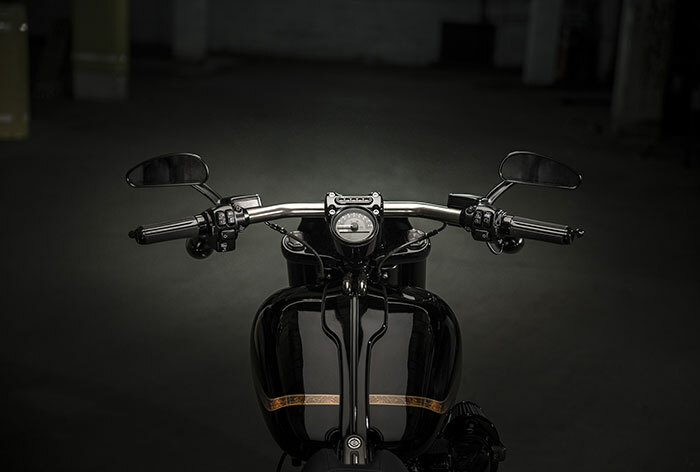 We’re the first to bring this deep, sinister finish to the metal on a motorcycle. Then we put it next to black for a layered effect. The CVO™ Pro Street Breakout® brings race-inspired attitude to the street, and the fixed speed screen and color-matched chin spoiler. Racing is in our blood. The CVO™ Pro Street Breakout® is custom, wheel to wheel, top to bottom. Look all you want. Try to find a piece on this machine that wasn’t hit with a custom touch. The controls are from our Airflow Collection, blacked out to fit the dark style of this machine. Footboards, shifter pegs, brake pedal and hand grips with knurled inserts. The closer you look, the more you see. There’s no license plate bracket on the fender to obscure the view of the massive rear tire for anyone you leave in your wake. 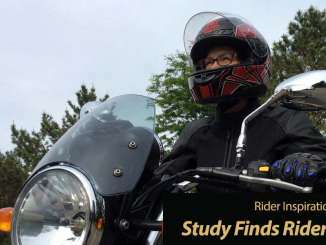 The side-mounted license plate leaves the look of the rear fender tight, clean and custom. The tank console on this motorcycle is simple, elegant and hugs the tank tight for a clean look. Two braided steel lines with our new smoked satin finish top off the tank in CVO™ model style. Let your eyes take a run over the Screamin’ Eagle® Twin Cam 110B™ engine sitting center frame in the CVO™ Pro Street Breakout®. You’re looking at 110 cubic inches of Harley-Davidson® V-Twin power, the result of generations of building the engines that truly move a rider. It delivers massive torque to the pavement and a soul-satisfying sound to the ears. The CVO™ Pro Street Breakout® delivers the power from its 110 cubic inch Screamin’ Eagle® engine to its fat rubber via our smooth-shifting 6-Speed Cruise Drive® transmission. You get massive torque on the low end, and smooth power delivery all the way up through the gears. You’ve got a lot of power under your command when you’re in the saddle of the CVO™ Pro Street Breakout®. The high-performance assist and slip hydraulic clutch has an easy pull, and it gives you a smooth delivery of power when the pavement opens up ahead of you. The convenience of keyless ignition and a factory-installed security system that arms and disarms automatically comes standard with the CVO™ Pro Street Breakout®. Just approach or walk away from the motorcycle with your fob, and the system does all the work for you. All the switches fall right under your thumbs on the CVO™ Pro Street Breakout®. They’re simple to understand and simple to operate with an improved tactile feel and a solid, satisfying click when you engage them. You get a premium level of stopping power and control when the time comes to rein it in. Anti-lock brakes are standard, along with the confidence that comes with having them. There’s no throttle cable cluttering up the lines on the handlebar of the CVO™ Pro Street Breakout®. You get the clean look and quick response of electronic throttle control. And thanks to standard cruise control, you get to ride easy on long stretches of uninterrupted highway. The CVO™ Pro Street Breakout® features high-performance dual front disc brakes. It’s an unmistakable sign of the racing heritage at the heart of this machine. It also features a reduced reach lever that puts the stopping power easily within your grasp. The drag bar on the CVO™ Pro Street Breakout® has a new smoked satin finish to add an extra level of custom style. But, rest assured, it isn’t just there for looks. The handlebar, seating position and forward controls keep you ready for acceleration when the light turns green.